Take a look at some of the features PocoMail offers, designed to help you spend less time on email every day, while making sure you are always safe and protected. Junk Mail Filters: enable sophisticated and flexible junk mail filters to help you deal with spam; PocoMail even integrates sophisticated learning Bayesian junk mail filter for accurate spam removal. Productivity - Tabbed mailbox access: pin your frequently used mailboxes for quick access; drag messages directly to tabs; open mailboxes in current or new tabs. Selective Index View: quickly turn a mailbox of 10,000 messages into a view of 10 messages from the sender you need; or show only unread messages; or only messages received today; revert to full view easily. Text Auto-complete: if you write a certain phrase over and over again when composing mail, utilize our auto-complete feature so that typing "addr" expands right away into your full address. Flexible Attachments Handling: supported attachments are previewed right inside the message, or with quick to access tabs, whether they are left encoded in the message or not. Special Features - PocoScript: exercise the ultimate control over your mailbox with the built-in scripting language; run your scripts on incoming messages, selected messages and even on timed or application-based events. PocoConsole: get instant overview and access to newly arrived mail; read and respond directly from PocoConsole without having to open the main application window. Quote Bar: if you don't like to quote complete messages when replying then don't - use the Quote Bar inside the Compose window to selectively quote the original message with a single click. Utilities - Message Markings: messages can be quickly marked with mouse or keyboard; once marked, they can be easily shown on their own, or even searched based on the mark applied. Emoticons: add some flare to your messages by inserting some of over 50 provided emoticons; these are tiny images that are actually sent with the message and viewed with almost any email client. Full page preview pane: you have a nice monitor, why squint at your half-sized preview pane? PocoMail lets you view your preview pane in full. Options: comprehensive set of program options allows you to fine tune PocoMail to your exact needs, including disabling most of PocoMail's interface and using barebones display. Mailbox Options: override global program options on per-mailbox basis, including preview pane visibility and orientation; optionally, apply these settings to all sub-mailboxes. Multiple Accounts: setup unlimited number of email accounts and newsgroup servers; drag and drop accounts in the order you wish to use them; many per-account options available. Hierarchical Mailboxes: organize your mailbox to suit you, not the application - different email accounts can share mailboxes, while Online Mailboxes can let you read Newsgroups or view messages server. Newsgroups Support: read Usenet or private newsgroups directly from PocoMail; save articles you need to your regular mailboxes; respond to authors or groups; pre-fetch next article automatically. Vertical Index Display: besides allowing for full page preview pane, it presents your mailbox in an easy to read format, with one click access to message marking and even threading. Address Tools: add any address to your address book with a handy "+" button in the headers; get Report on Address with the other button, see if you have this address in any book or group and add it quickly. Your evaluation license expires after 45 days. If after that time you continue using the software you are required to purchase it. You will unlock the few features disabled in the evaluation version. You will be able to: - Use the Email Support menu to report problems; - Your sent email will have the X-Mailer header as "PocoMail Licensed", instead of "PocoMail EVALUATION", showing your support; - Remove further purchase reminders. Barca is powerful email program, which can manage your personal informations in a safe enviroment This includes planning and scheduling tasks and appointments, communicating with others, and collaborate on team projects. The Mail Redirect is a simple routing software application that allows you to redirect messages from the existing mailbox to another mailbox located anywhere in the net or your local network. MailMaint for Windows is a simple POP3 Mailbox Maintenance tool which supports multiple POP3 mailboxes, allowing headers to be accessed, messages to be read and deleted, and new email and replies to be sent. Powerful tool which helps you backup and archive your important correspondence organized in one file, converting emails from PocoMail (very popular email client) to any format you wish (CHM, PDF, HTML, RTF, HLP, TXT Ansi, TXT Unicode, DOC, EML, DBF, XML, CSV, XLS, MCW, WPS, SAM, RFT, WS4, WS7, WRI, etc. WeOnlyDo! COM Mailbox is a MIME component that can be easily integrated into your applications to provide full management over mailboxes and for message parsing. 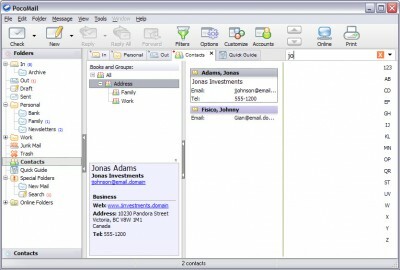 POP3 Pal is a useful mail client utility specially made for people on the move. Express Mail@Mate is an email notification program for Microsoft Outlook and Outlook Express.